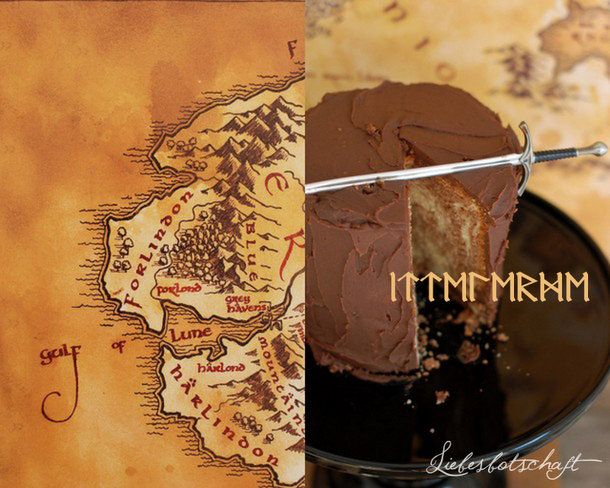 Liebesbotschaft International: The Hobbit- sweet table. The Hobbit is absolutely the flavor of the month right now, and especially the weapons are what fascinate Ben the most. What is it: weapons and men? Ever since Ben was able to walk a straight line he always held some stick in his hand, ran around with it and waved it right and left (often accidentally striking his elder sisters). The passion has remained unbridled until this very day and it comes as no surprise that Ben’s deepest wish was a REAL sword. Thanks to our trip to Rome we could fulfill his wish, as that is where we found a well-made and affordable copy of the antique weapon. By the way Ben named his sword, polishes it lovingly approx. 3 times a day and I wouldn’t be surprised, if he went to sleep with it at night. 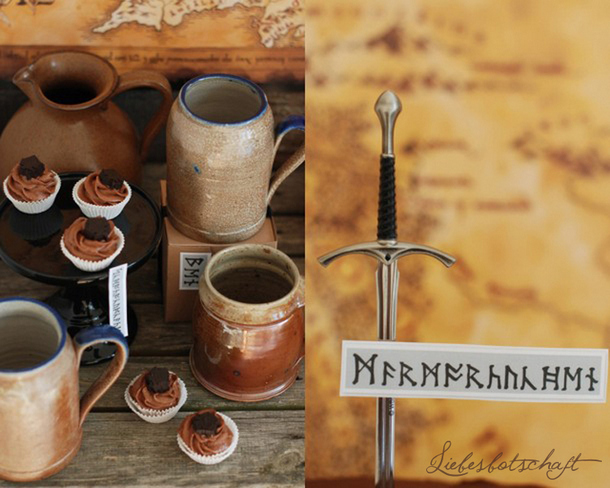 I wanted to design the Hobbit dessert table to be not so much child-like/playful, but rather fitting for a teenager. Since Ben’s absolute favorite is marble cake I made it in shape of a tree trunk. The map of Middle Earth served as a backdrop and lemonade was being served in rustic pitchers which I bought at the flea market for a few Euros. 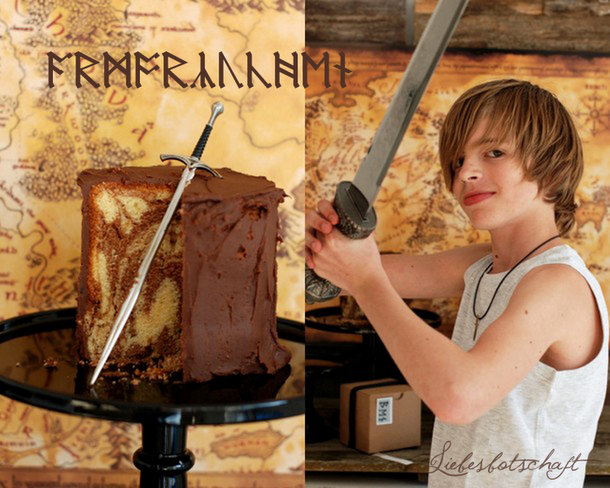 The paper knife in shape of Gandalf the Grey’s sword was a little more pricey – but it made a 13-year-old very happy. 1. The marble cake is baked in a small tall pan and afterwards covered in chocolate ganache. The latter tastes very delicious and can be applied wonderfully as a kind of “bark”. 1. 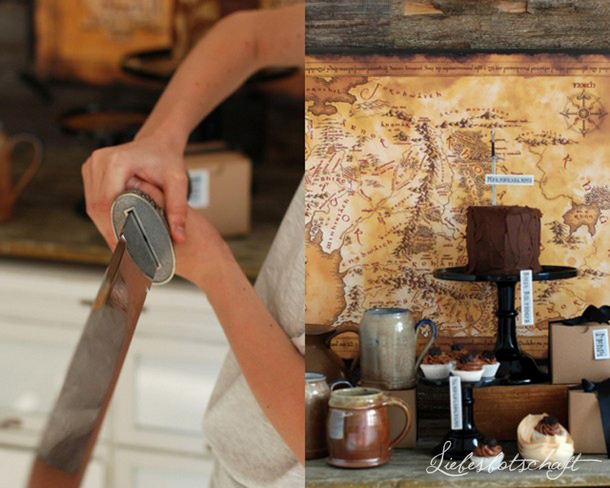 Chop the chocolate into small pieces with the help of a big knife. 1. Bring the cream to a boil in a small casserole, add the chocolate and let sit for 3-4 minutes. 3. Mix well and leave in a cool place, ideally over night. You can place the casserole into the refrigerator for a few hours, but the ganache shouldn’t turn harder than soft butter, because otherwise it will be hard to apply to the cake. Cover the cake with the finished ganache using a knife with a wide blade, then place the cake into the refrigerator for a few hours. If you want to write the children’s names and the words on the little cards in Elfish, you can do so quite easily with the help of this site. As wallet and all papers and identification (and a heap of cash) got stolen from us at the Pantheon we had to reenter Germany with virtually no identification. This post was translated by Eva from Ginell Studio. While I am taking pictures for this post the living room is in a state of post-nuclear destruction. Noelle and her girlfriends are working on a new shooting, shift furniture back and forth and at the same time listen to this album, volume at the max. I climb over mountains of scattered clothes and props, and try not to step into puddles left behind by Ben and his friend after swimming in the backyard pool. We eat corn on the cob, bean salad, melon, marble cake, cherries and ice-cream, the same table is simultaneously a make-up station and a cupcake decorating spot, and the creative flow in the room is almost palpable. In the midst of the biggest chaos a girlfriend from far away pays a spontaneous visit (of course! Always the one time the house happens to be untidy! ), the girls clean the kitchen and decide on a whim to stay for the night, I prepare dinner and cocktails for us all, afterwards the teens watch a movie while my friend is being forced voluntarily braids my hair. Philips Visa Care - give-away!